Fixing Tinkercad – New Help Center, Server Status and More! We have been working on a few improvements that we wanted to share. They will be rolled out over the course of the next few days. So sit back, relax and enjoy. On January 22nd from 9:00pm to 11:30pm (PST), we will be taking Tinkercad offline. When the site comes back online users will enjoy the following new updates. 1 – HELP CENTER – Tinkercad has partnered with zendesk to bring strong customer service to our users in one central place. We’ve aggregated the most commonly asked questions from our inbox to provide a comprehensive FAQ page, which covers general Tinkercad issues, as well as Kid accounts and some residual migration issues. If you don’t find the answer, you can also submit a question as a ‘ticket’. This will allow us to keep track of all the inquiries so no one gets lost in the shuffle. It’s yours to use! 2 – SERVER STATUS – One of our main goals of #FixingTinkercad was to be transparent to our users. One way is to provide you with 24/7 access to the status of the servers. We know that many of you depend on the site in your classroom, business or free time. The Server Status will be accessible under Resources > Server Status at the bottom of the website. 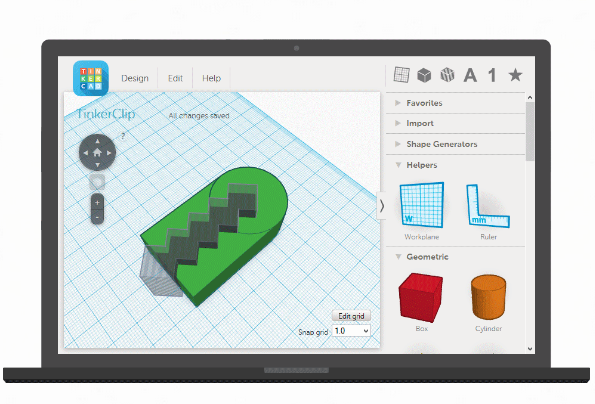 3 – WEBSITE REDESIGN – As the Tinkercad community has grown so have the needs of our website. We hope that you enjoy the new updates. They include a new home page, dedicated information about key features and learning resources. Let us know what else you would like to see! Previous Birdwatchers Beware: Digiscoping Meets 3D Printing! Next Casting Call: We need contestants for The #PenguinDatingGame! Moving the bar forward does sound exciting. But please, make absolutely certain that all changes have the thoroughly and realistically tested before go-live. Congrats. I’m sure there’s a lot of hard work behind these updates. Looking forward to the updates! THANK YOU for doing in the evening!!! Less than a day after these latest set of updates, the site seems to be running normally. Again, thanks for delivering a solid update. I’m glad to see that the site now includes a server status page. A page like this is somewhat helpful, though presenting response times, availability 9’s and downtime with a resolution of an entire day is not very helpful in the moment. When a user is monitoring server status it’s often because they’re experiencing poor response time at that very moment. Looking at response time values that have are the average over the prior 24 hours doesn’t help them understand what things look like right now. What they need are values having minute by minute granularity. Or better. The Pingdom tool that the server status page is built upon needs to be reconfigured to provide that level of detail in additional to the longer views the page currently provides. The FAQ found on the first version of the recently added “Need Help?” page is also a good start. I’m sure a significant percentage of queries can be addressed by the Top 10 responses currently listed. That said, I look forward to a much more complete set of tools including a real knowledgebase so that users and instructors can quickly get the answers needed to get productive again. I’d love to see persistent login. I’m here every few days and it seems a bit silly to have to login on every visit. I’d prefer to just bookmark my project page and get straight to work. I agree. Options like this are obvious to everyone else. Now in Chrome you can’t even get it to remember your ID and Password. I would also like to see this. When the difference between doing a model graphically here and coding it in OpenSCAD are minimal, I go to OpenSCAD every time. It seems like a little thing, but being able to double-click and start working immediately is a big thing for me. As currently configured, the Tinkercad Server Status page is a PR tool and NOT a legitimate indicator of system response times. Right now, for example, the Tinkercad Server Status shows everything operating nominally — solidly dark green. And yet, the site is unresponsive. The main page, the home page for users not logged in and the dashboard for those that are, is unable to render after over 3 minutes of waiting. I have a drawing open with 18 edits stacked up for over 5 minutes. I am loving this new ticket support system. I really value the peace of mind knowing that once I submit a ticket, I will never again be contacted by anyone from support, not even an automated message. Meanwhile, emails to team@tinkercad.com still get a response, even on the weekend. I don’t see any tickets from you in the Help Center; it’s monitored by the same team that receives the team@ emails(ours) and there aren’t any unanswered tickets that I can see. If you’re asking about the Shape Generator you submitted, I believe the team replied already. If not, let us know how else we can help. There are now 20 pages of shape generators available in Tinkercad – you have a great community of people supporting this! Is there anyway to search them without going through each page? Is there a way to mark generators as favourites so I don’t have to try and find it again? This would be a topic for another great static page like your keyboard shortcut page! I’m not sure how to help you there. Try emailing the Tinkercad Team.